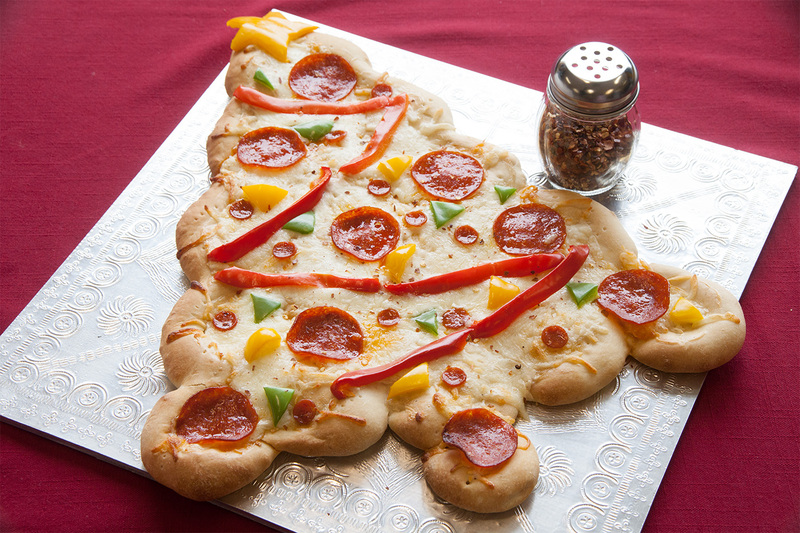 This is a fun Christmas pizza that the kids can all help make, decorate and eat! Place 16 rolls on a sprayed baking sheet in a pyramid shape starting with one at the top, two under it, then 3, then 4 and the last row 5 rolls. Leave some space between the rolls. Flatten and press rolls together to form a tree shape. Press middle of the rolls in, leaving the outside edge slightly rounded so the sauce and toppings do not run off. The trunk of the tree is one roll placed under the last row of 5. Tuck it under and flatten. Poke rolls several times with a fork to prevent bubbles from forming and pre-bake at 350 degrees F 10-12 minutes. Remove from oven and allow to cool. Spread Alfredo sauce over the crust, then sprinkle with cheese. Decorate as desired with pepperoni, peppers cut into different shapes and red pepper flakes. Bake an additional 10-12 minutes or until cheese is melted and crust is golden brown.